Mostly Average Accounts of the World's Okayest Mom. I’ll Consider it a WIN! 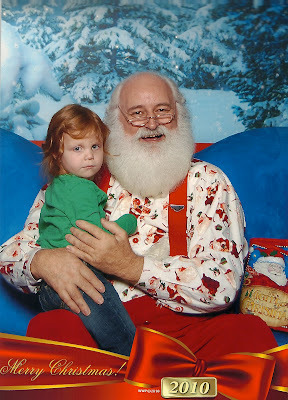 For the first ever visit with Santa, I’ll consider this a win. She was a little apprehensive at first, sitting on my knee instead of the big-guy’s. She said she didn’t want her picture taken with him. I was fully prepared to walk away with nothing. Then, Santa asked her for a hug. And she complied. Then when she turned around? Click. She did make sure to ask Santa for…wait for it…candy. Candy? Candy. Where the heck did she get that from?! That’s it. I’m taking back everything else we got for her…like the toddler-tough digital camera, the play-doh and the puzzles and I’m getting her a bag of M&M’s. This entry was posted in holiday, montser, Terrible Twos on December 20, 2010 by katherine. Too funny. I reconize this Santa. This Christmas Photo that didn’t Make the Card. For the Record…We own guns. Here We Go Again…January Update! Enough with the pink already!